Other Monuments: In this page and in those linked to it, we wish to give you another glimpse of the diversified Bronte’s historic-architectural patri­mony. Little oasis, characterized by beauty and uniqueness, that after centuries still remind us our past. Launch sites for possible visits or excursions with a leap in the past and in the environmental features of Bronte’s territory. 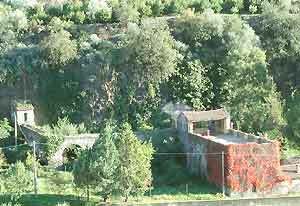 The ancient paper mill constructed on the banks of the Simeto river, in district Malpertuso, ( belonging today to mr Giuseppe Carastro) is probably of Arabic origin (XI century). 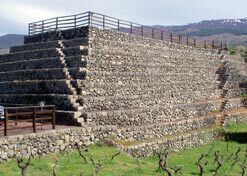 Yet, still well preserved, it is located on a bank of the river under a cliff of lava stone, near the “Passo Paglia” bridge. 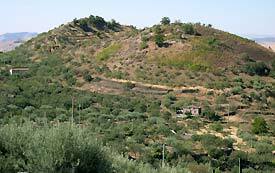 It used to constitute a “Grangia of the Ricchisgia”, an agricultural community (a farm alongside a small convent) where Benedictine friars (afterwards basilians) and farmers used to pray and live of agriculture and other small industries. Can be definitely said that the humble, hard working friars were the first agricultural-industrial group of Bronte: they milled wheat, made rough cloth and paper, cultivated fields, assisted the local farmers giving them also some sulphurous water which used to drip off the basalt cliffs overlooking the convent. 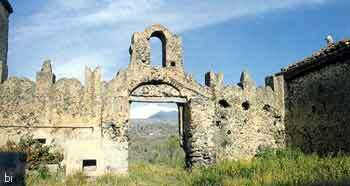 The remains of a seventeenth century villa in Malaga district (also called Rodriguez’s Castle), probably constructed over an ancient monastery or Grangia Basiliana of the IX or X century. 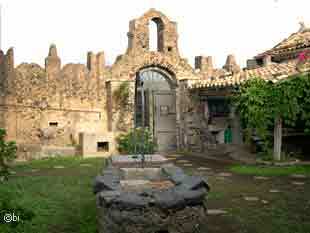 Set in the middle of the “lochi” (Bronte’s pistachio groves) has a little internal cloister with, in the centre, a cistern and a lava stone wash basin. Even today, the ancient Grangia, privately own, and partially restructured, fascinates for its beauty and the simplicity of its shape. 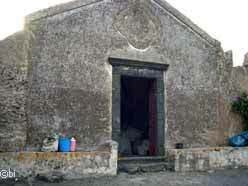 The little church (place of worship up to the years ’50) has been changed to a rural storehouse. 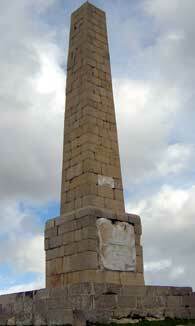 Today, the centenary stele for years shows the signs of time but above all the constant devastation and offense of man. The cracks mark the large blocks of sandstone for a long time, some of which are missing, and the base is also compromised. Before it goes completely into ruin more than the negligence of time for the continuous, perennial vandalism it seems appropriate to launch an appeal for a conservative restoration also fencing the place to avoid the direct and devastating access of the numerous off-road vehicles on Sunday. 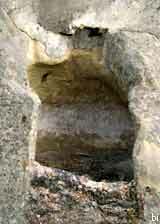 Some characteristic funerary cells in the Contura district, at few kilometres from Bronte. They are similar to those of “Difesa” and other close by zones (Placa Baiana, Margiogrande, Mangiasarde, Grotte dei Saraceni, …). 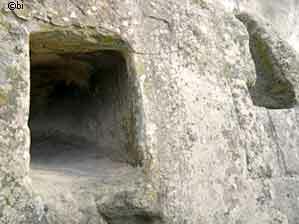 They are excavations in the sand stone “a grotticella” (for Bronte “I gruttitti”) and were used to bury in them the dead together with a rich kit. This strange typology is found in various sand stone outcrops between the Simeto’s high valley and the Alcantara’s middle valley; is being studied now and it is thought, without positive proofs, that could actually go back to the Byzantine period. In another Bronte’s zone (Santa Venera district) some excava­tions, carried out by the superintendence in 1987 and 1988, have brought to light the remains of a boundary wall and of circular, square and polygonal houses of probable prehistoric origin (medium Neolithic). 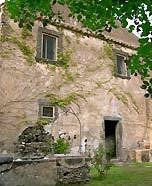 See also the primitive example of rural architecture that is found in the countryside of the north-eastern slope of Etna (in the territo­ries of Bronte, Maletto and Randazzo): «'U pagghiaru' n petra». 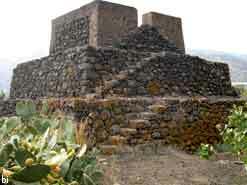 This is a typical construction in dry masonry of lava stone with a conical pseudo-dome. Some built even in very distant times have survived very well all the earthquakes that periodically upset the Etna area, but, unfor­tunately, not the incivility and vandalism of our time. 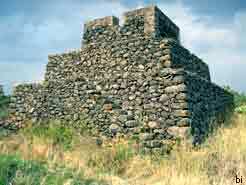 One of many Guard towers made of loose lava stones picked and piled up changing the space in some sort of cultivable ground. 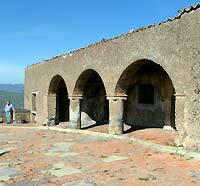 This, with a vaguely Mexican look, is found close to Bronte, in the Lombardo farm ("Masseria Lombardo"). 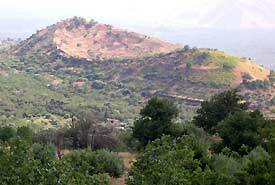 Lacking fertile land, mostly owned by the Duchy and few others, Bronte’s peasants, to be able to survive, were forced to try to cultivate the stony land, to clear many lava flows and change them in areas for the cultivation of pistachio. that grows spontaneously on stony ground and adapts itself for its rustic nature and resistance to drought. With a very deep root system is able to push its way trough the lava’s cracks and grow easily. Picking stones and piling them up, during many centuries of hard work, the local farmers were able to survive with this technique changing many sterile stony fields in areas where could be produced small tasty fruits of extraordinary high quality. 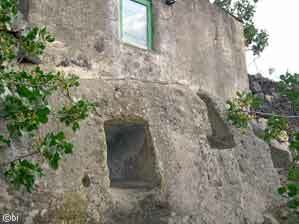 THESE TURRETS have been defined by some researchers or even archaeologists «Pyramids of Etna»; they also saw a desired spatial orientation, assuming that they served the worship of the God Vulcan or other deities of the ancient Siculians, which could date back more than two thousand years or have even been built by a tribe lived a thousand years before Christ, or from the Siculi (III century BC), as true sacred temples dedicated to their divinities. 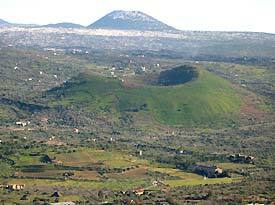 Monte Barca: This small volcanic cone, opposite to the cemetery, adjacent to state road 121, few kilometres from Bronte, is of extremely ancient formation. Protected by mount Colla, has been always spared from the centenary lava flows that have intere­sted the Bronte side and because of this remains still intact. About it, Benedetto Radice says: «It is placed in a deep cone no more than eight metres from the provincial road built in 1830. 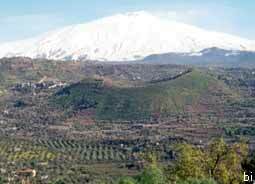 Monte Barca is the second most deep Etna’s crater, so called because is shaped like a boat. Nobody knows the time of his formation; it has an elliptical base. 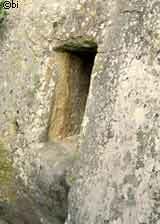 The two widths in its interior mark the direction from South to North. The crater’s basin, made of reddish tuff and notable for fumes of chlorine and sulphur, reminds the Naples sulphur’s mines. From this tuff come small slates and little bright iron crystals. The external mantle of the cone is made of a conglomeration of plagidasio, angite and olivine fragments between which can be found some material rich of white iron; the lavas around Catania’s Fortino and mount Cerna are similar to this tuff. O beautiful mountain with the agile forms of a Latin ship launched on the high seas; constant adoration of my early years, when in the clear and serene days, from the top of your stern or your bow, I consumed the young and ardent soul drunken to the boundless horizons that I then had to try; (...) Once the old Etna, in order to be at rest, wanted to amuse himself in another way, but with the same flaming spectacle, his people. 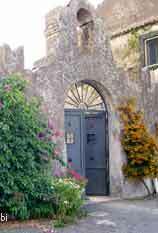 It is particularly interesting to walk the little streets and the lanes, narrow and tortuous and the flights of stairs of Bronte’s historic centre for the presence of ancient buildings of a simple and pleasant architecture, remarkable portals made of sculptured lava stone, aedicules, votive icons and small sculptures placed over lintels or the arch of houses.